Offering more orthodox looks than other models in the manufacturer's range, such as the Kia Soul, the Carens plays it straight with its contemporary styling. This seven-seater MPV is a superb choice for families that require plenty of space and a flexible interior, and thanks to the Carens' economical nature it's reassuringly inexpensive to run on a day-to-day basis. 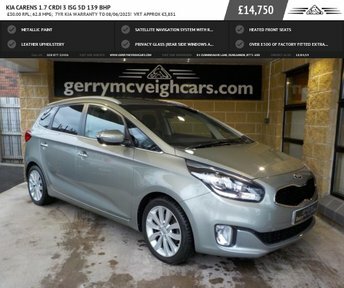 Find out more about the range of used Kia Carens models for sale in Dungannon today by contacting a member of the team at GMV LTD. We'll be able to help you narrow down your options and find the perfect model to suit your budget and lifestyle.